Initially established and manned by peninsular Spanish regulars in 1765 as an infantry battalion to occupy Luisiana, acquired from France three years earlier, what would ultimately become the veteran and professional Regimiento de Infantería de Luisiana formed the core of Spain's military establishment in Louisiana and, later, in the Spanish Floridas until it faded into oblivion during the terminal period of Spain's colonial tenure in North America. Reorganized after its arrival in North America in 1769, the battalion's detachments performed garrison duties at outposts in Spanish Louisiana as far north as Illinois. In 1779, when Spain joined France in an alliance against England during the American War for Colonial Independence, the unit was enlarged to regimental strength through the addition of a second battalion and participated with distinction in the 1779-1781 conquest of then-British West Florida under the leadership of Louisiana Governor Bernardo de Gálvez. 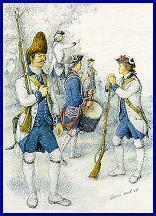 Spain's official repossession of Florida by the terms of the 1783 Treaty of Paris resulted in a third battalion being added to the regiment for service in the Floridas in 1786. This seemingly impressive force was, however, a "paper tiger." It never achieved its newly authorized strength in manpower, nor did it enjoy adequate supplies of material provisions to properly maintain itself. After the retrocession of Louisiana by Spain to France in 1800 and that territory's subsequent purchase by the United States in 1803, the unit served exclusively in the Spanish Floridas. Soon, Florida itself began to yield to the pressures of American nationalism, military aggression, and demographic expansion, a process that was accelerated by Spain's rapidly deteriorating position in both Europe and its other New World colonies. By 1813, Floridawhich had once extended westward to the Mississippi River and northward to a line extending eastward from the mouth of the Yazoo Riverhad been reduced to the size of that present state. Plagued by shortages of support, supplies and manpower, the Louisiana Regiment, like Spain's once-formidable presence in North America, steadily deteriorated. By 1816, the unit had dwindled to a single battalion with a strength of less than 200 men, and it is not clear if the once-proud Louisiana Infantry Regiment was still in existence as an autonomous unit when Spain ceded Florida to the United States in 1821. 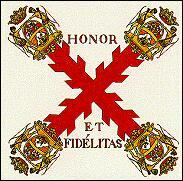 Above: Louisiana Regiment's Colonel's Flag; Top of Page: Flag of the Regimiento de Infantería de Luisiana with the Regiment's motto, "Honor and Fidelity." The uniform colors of the Louisiana Regiment remained constant from the unit's inception to its end. Officers and men wore French-like white coats with dark blue collars, cuffs, and linings; blue waistcoats and breeches; white hat lace; and white metal (pewter for enlisted men and silver or silver plated for officers) buttons. The use of white metal buttons and trim was unusual in the region's Spanish colonial military establishment; most units used "yellow metal," or brass/gilt buttons and insignia. The regiment's uniform coat buttons were all on the wearer's right side, and the cockades were, like those of other Spanish units, red. Right: Capitán Segundo in his 1815 regulation regimental uniform. Until marked buttons were universally mandated for Spain's armed forces in and after 1795, officers of the Louisiana Regiment wore plain, bone-backed, silver plated copper foil faced buttons like those shown at left, while enlisted men wore unmarked cast pewter buttons. Foil clad, bone-backed buttons similar in construction to these were worn by both civilians and officers in Europe and America during the period and were attached to their uniforms via catgut cords strung through the holes in the buttons' bone backs. The enlisted men of the Regimiento de Infantería de Luisiana wore unmarked cast pewter buttons, examples of which are shown both above and below, from that unit's creation until its receipt of generic, general issue marked infantry buttons after the beginning of Spain's epic 1808-1814 rebellion against France's armies of occupation. 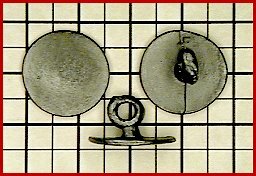 Common to all of these button forms are the pedestal-like bases upon which are mounted and elevated the buttons' eyes above their reverse surfaces. 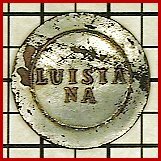 After 1795, officers of the Louisiana Infantry Regiment wore slightly convex, silver plated copper buttons marked "LUISIA / NA," of which the button shown at left is an example. This specimen suffered damage to its outer layer of silver plating as a result of falling and for over 175 years being interred between the articulated bricks of a walkway and wagon path at a Spanish colonial mill site in northwest Florida. During Spain's 1808-1814 War of Independence against the occupation forces of Napoleonic France, the Spanish military establishment issued generic cast pewter "YNFANTERIA" and "INFANTERIA" buttons to its regiments of infantry to avoid the complexities inherent to the manufacture and issue of unit-specific devices or designs. This mentality was and remains mirrored by the United States beginning with its War of 1812 issue of pewter script "I" buttons to its enlisted infantrymen. The examples shown here were recovered from sites occupied by the Luisiana Infantry Regiment in Florida, and it is likely that these remained in use by this unit until the end of its existence in North America. At far left and right are coat buttons; the small example at center, left is a vest or cuff button; and the diminutive, unmarked example at center, right is a gaiter (legging) button of this pattern. 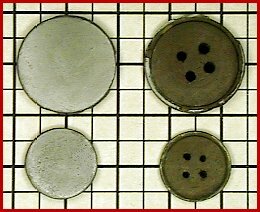 Substantial numbers of cast pewter waistcoat or vest size "INFANTERIA" buttons are found in what formerly comprised Spanish West Florida. Crudely fashioned with reversed letters "N," these are widely believed to have been made in Florida. The example at far right is one cast from the same mold as the button shown in the center after that mold had been scraped, presumably to remove corrosion, creating a rough, almost faceted appearance to the button's face and denuding the cavity of nearly all of its central detail except the fragmentary remains of the second reversed "N" of "INFAN / TERIA". This solid cast silver fleur de lis button, recovered from a ca. 1781-1821 Spanish military occupation area disturbed by construction, features a silver (and very typically Spanish) looped wire eye silver brazed to its back. 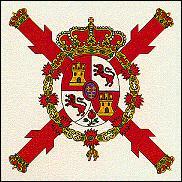 After 1700, when Spain acquired a French king (Phillip V, the grandson of King Louis XIV), the "Bourbon Lily" became part of the Spanish royal coat of arms and began to appear on many Spanish standards, insignia, and uniforms. 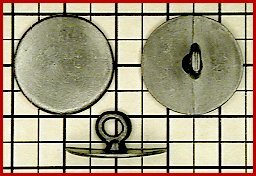 This non-functional, ornamental button may have adorned the cuff or collar of an officer in the Luisiana Infantry Regiment during the ca. 1795-1815 period.